The Union Ministry of Finance has released the data for GST revenue collection for the month of December 2018. 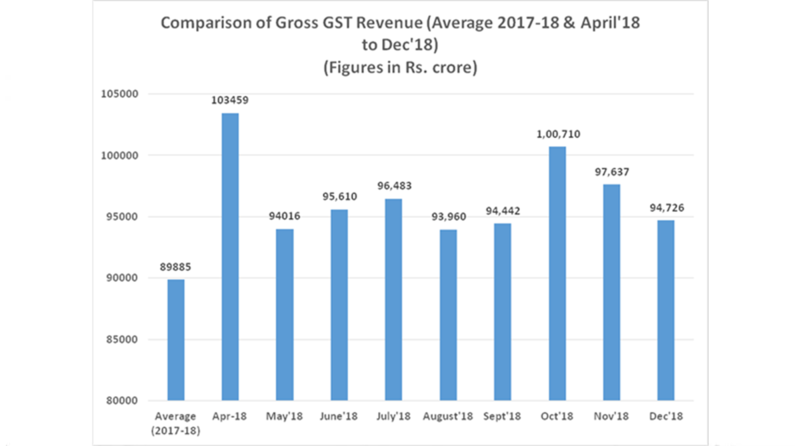 The total gross GST revenue collected in the month of December 2018 is Rs 94,726 crore. Of the total amount, according to a statement issued by the ministry, CGST is Rs 16,442 crore, SGST is Rs 22,459 crore, IGST is Rs 47,936 crore (including Rs. 23,635 crore collected on imports) and cess is Rs. 7,888 crore (including Rs. 838 crore collected on imports). The total number of GSTR 3B Returns filed for the month of November up to 31 December, 2018 is Rs 72.44 lakh. The government has settled Rs 18,409 crore to CGST and Rs 14,793 crore to SGST from IGST as regular settlement. “Further, Rs 18,000 crore has been settled from the balance IGST available with the Centre on provisional basis in the ratio of 50:50 between the Centre and states,” says the statement. After regular settlement, the Centre and the states have earned a total revenue of Rs. 43,851 crore for CGST and Rs 46,252 crore for the SGST in the month of December 2018, as per the statement.